After she left me, and after I had given up hope, destroying the burden of past things began the process of healing. It was in 1994, and we had been together for about six months, when she gave me the pillow, a mini-bolster, for Christmas. The pillow went with me almost everywhere, and once even had a hole burnt through it when I dropped it on a mosquito coil in my sleep on a beach trip (hence the heart-shaped patch — her deft mending). I kept it even after she left me, partly out of habit, partly out of the small comfort of feeble hope. Last month, I decided to inflict that comfort upon myself no more: I took the pillow, and tore it up. It was not an easy thing to do, in more ways than one. The pillow was tougher than I had expected, and did not yield to bare hands. I had to go through the deliberate and even more painful act of slicing through it with a cutter — an act which, in the doing, felt like I was stabbing myself in the heart. Deeply. 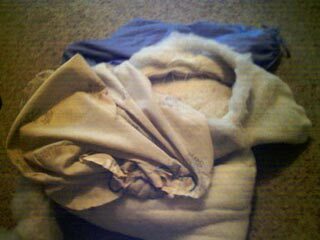 With the casing torn and mangled, the stuffing revealed itself after six long years: a rolled-up sheet of loose cotton, not unlike a giant cotton ball. The tear in the pillow case had gone right through the heart-shaped patch, splitting it cleanly in two. I laid what was left of the pillow out on the floor, snapped a photo for posterity, and stuffed the whole mess into the trash. Then I collapsed into my chair and wept, and wept, and wept; bitter, anguished tears, through which I whispered to the air how much I hated her for her fickle, uncaring heartlessness. There was just no love left. None. Only sad regret, and disappointment, and other terrible, horrible feelings that I hated myself for letting pass through my heart. The garbage truck came to pick up the trash the next day. I was away at work, and tried not to give it a thought. It’s been a couple of weeks. It’s been half a year. It’s been almost a decade. I sleep with only one pillow now. I do not think I will sleep with more than that for a very long time. it may have been for the best. it hurts, true, but i saw it as a necessary act. Beautiful writing from your pain. Spare and sadly lyrical. You haven’t come back from desolation with empty hands. In prayer still that you be healed and lifted.